- Even though Miguel Celestino (pictured) is 24 years old and in his second season in Portland after a tough 2013, he still has intriguing raw stuff that could play in a major league bullpen if he puts it together. Celestino’s calling card is his fastball velocity as he will sit 93-96 mph with late arm-side run. His delivery is still rough, but cleaner than previous years, with a lot of moving parts and long arm action behind his body, including a slight stab. The big improvement for Celestino has been his control as he has done a much better job throwing strikes, albeit he still needs to refine his command. 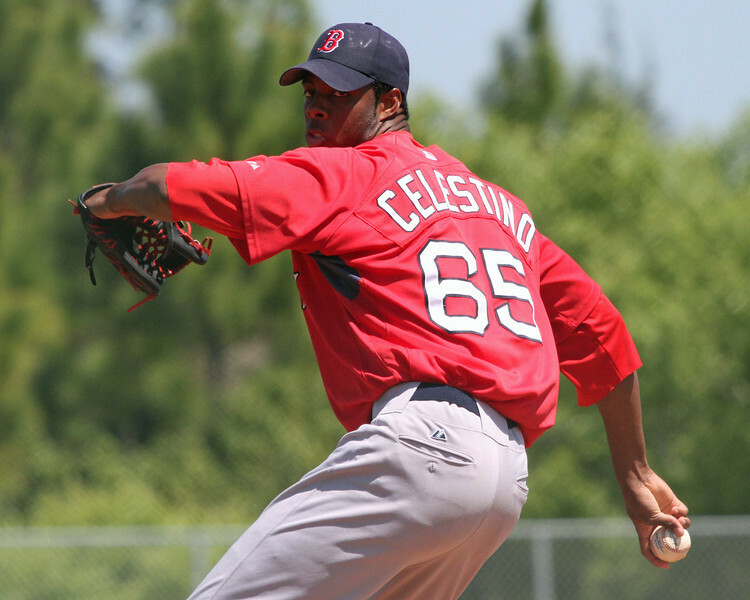 For example, in a recent outing scouted, Celestino threw 17 of his 25 pitches for strikes in his two innings of work. Celestino complements his fastball with two secondary offerings, a changeup and slider. His 84-88 mph changeup was inconsistent, coming in firm and straight at times, while other times flashing plus, showing late darting action to the arm side and bat-missing ability. Celestino used his slider sparingly in the outing coming in at 83 mph with late action. - Though Noe Ramirez doesn’t have standout stuff, he is an intriguing arm and could one day find himself pitching out of a major league bullpen. Ramirez comes from the side, with a quick arm and deception due to his low arm slot, especially against right-handed hitters. Ramirez is a good athlete and is able to repeat his delivery. He has solid command of all his pitches, starting with his 89-91 mph fastball with arm-side run. His changeup is usually his best secondary offering, but in this recent look he didn’t get a chance to use it much and when he did it was 84-85 mph and firm. He utilized his slider more in this outing, coming in at 79-82 mph, but lacking tilt. - The first thing that stands out with Michael Olmsted (pictured) is his size as he has a huge pitcher’s frame. Olmsted is listed at 6-foot-6, 280 pounds and looks the part. Olmsted has effort in his delivery with long arm action behind and balance issues that result in him landing hard to the first base side. During this look, Olmsted’s velocity was down compared to when I saw him during his first time with the organization. Olmsted sat 90-92 mph with his fastball, topping out at 93 mph. His command was inconsistent as he lost his line to the plate at times and struggled to find his release point. 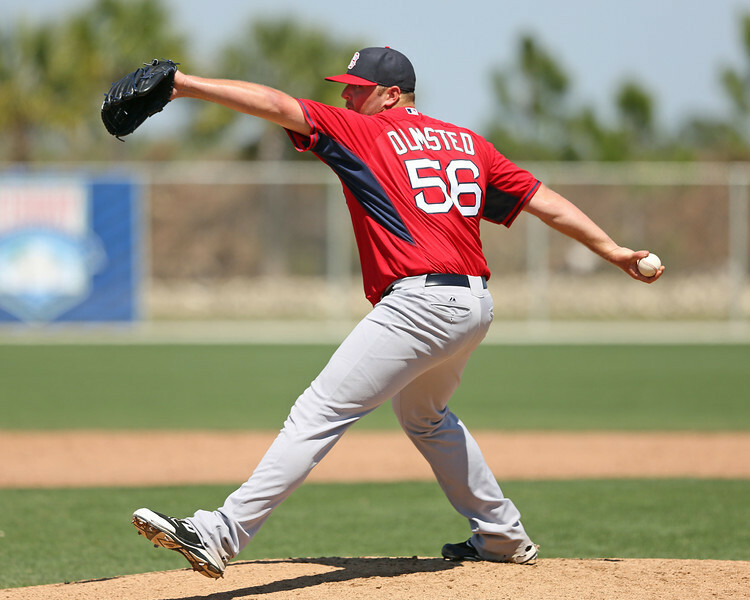 Olmsted featured two breaking balls, a slider and a curveball. He threw his slider at 77-82 mph with 10-4 break. His 12-6 curveball was slower, coming in at 73 mph, and was show-me offering that he slowed his arm throwing. At times, he got caught in between the two offerings resulting in him throwing a slurvey breaking ball on the lower end of the slider velocity range. - Robby Scott’s raw stuff didn’t stand out in a recent look, but he has a solid understanding of how to pitch and some deception in his delivery. Scott throws from a three-quarters arm slot with a simple delivery. He has filled out his 6-foot-2 frame and has a sturdy lower half. Scott is dependent upon command and control as his velocity fastball velocity is below average, sitting 87-89 mph. He does get some late arm-side run on the pitch and he is tough to pick up as he hides the ball until late. He complements his fastball with a mid-70s curveball that has 1-7 movement and late depth through the zone. He also mixed in a low-80s changeup, which he has good feel for and throws with similar arm speed to his fastball. The pitch was relatively straight, but showed late cut when he turned it over. 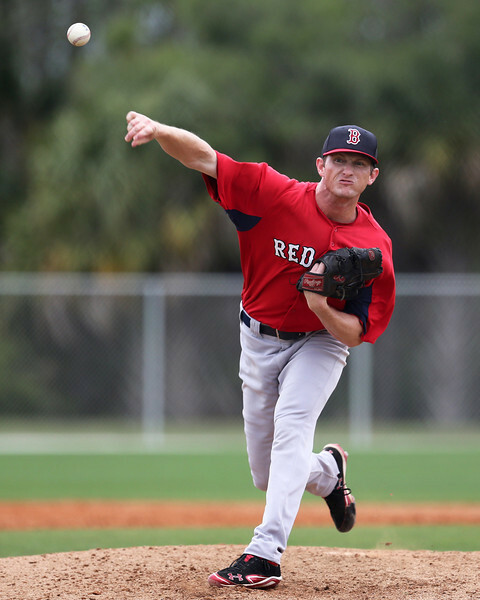 - Mike McCarthy (pictured) started the suspended game in a recent look and threw well over his five innings of work. McCarthy is on the thin side and has a controlled, compact delivery. His delivery is a little stiff and he has short arm action, but does a good job repeating it and works quickly. He doesn’t have overwhelming stuff, rather pitching to contact and getting outs by manipulating his fastball and mixing in his secondaries. His fastball worked 88-90 mph, topping out at 91 mph. The pitch was heavy, showing boring action. He also threw an 85-87 mph two-seam fastball with downward movement. McCarthy’s secondaries included a straight changeup at 79-81 mph and a short mid-to-high 70s slider.